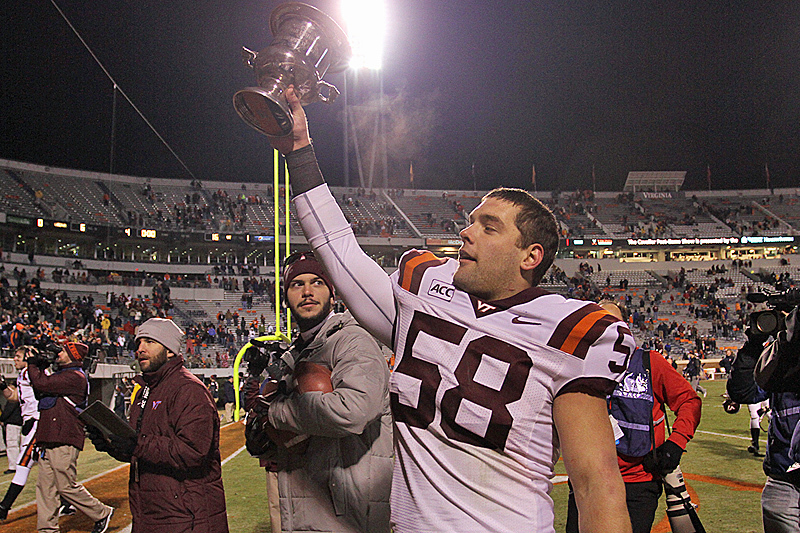 The 2014 NFL Draft begins on Thursday night, and several Hokies are going to hear their names called, beginning with Kyle Fuller in the first round. 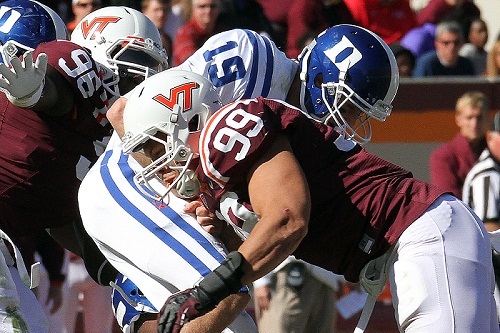 Only a handful of Virginia Tech players have been selected in the first round. Here’s the list. Kyle Fuller has a chance to join that select group on Thursday night. Fuller is rated anywhere from the #1 to #3 cornerback prospect in the draft, and he is projected to go anywhere between #10 overall (Detroit) and #31 overall (Denver). Fuller has a bit of an injury history, playing through an injury in 2012 and missing the second half of the 2013 season. However, all scouts have to do is turn on the film to see that he is one of the best pure football players in this year’s draft. He also put up more impressive combine numbers than people were expecting, which shot his stock up even more. Other teams who could potentially take a cornerback in the first round include (but are not limited to) San Diego (#25), Cleveland (#26), Chicago (#14), Philadelphia (#22), Pittsburgh (#15) and Cincinnati (#24). It’s starting to seem like Fuller won’t last past the #15 pick, though the rumor is that the Eagles love him at #22 and would love to take him. In researching this article, I found many breakdowns of Logan Thomas on various sites that describe him as a “converted tight end.” Sigh. You’d think these NFL Draft sites would do their research. Thomas has never played tight end. He played quarterback his last two years at Brookville, and he was a wide receiver before that. Even the NFL’s site says he is a “converted tight end,” and another article I read said Thomas was a “former college tight end.” Hint: if you’re going to cover the NFL Draft, at least spend a little bit of time doing research. Okay, rant over. Thomas was one of the top performers in all of those categories, showing NFL scouts that he truly is a physical mismatch at the quarterback position. However, his inconsistency and accuracy issues of the past have hurt his draft stock. Physically, he looks like a first rounder, but he will slip to the mid-to-late rounds. Where he will be drafted varies from scout to scout. Some think he will go in the third to fourth rounds, while others think he is more of a fifth or sixth round selection. It would be most beneficial for Thomas to land with an NFL team that is stable at quarterback, and that has a coaching staff that is expected to be around for awhile. He needs to sit for 2-3 years and truly learn the position in a pro-style offense. I have a hard time seeing Thomas dropping to the sixth round. However, I don’t think I’d waste a third round pick on a quarterback with his question marks (that’s just a personal preference). I think the fourth or fifth rounds seem like Logan’s likely destination. Gayle’s NFL stock has slowly dropped over the past year as teams have learned that his on-field production doesn’t match up to his strength and conditioning numbers. Also, the question of whether he’s better suited as a 3-4 outside linebacker or a 4-3 defensive end has popped up. Gayle has been interviewed by several teams, and he has visited the Tennessee Titans. Some projections have him going as high as the third round, though most list him as a probably fourth or fifth round selection. It’s certainly possible that he could be selected before Logan Thomas. Right now, if he’s drafted as a 3-4 outside linebacker, Gayle is viewed as a situational pass rusher. He doesn’t have the pass coverage experience to be an every down player at this stage of his career. Like former VT DE Jason Worilds, who now starts at OLB for the Pittsburgh Steelers, he would have to develop that ability over time. Exum had workouts with the Titans, Falcons, Buccaneers, Panthers and Cardinals, though questions remain about not only his health, but his ideal position at the NFL level. 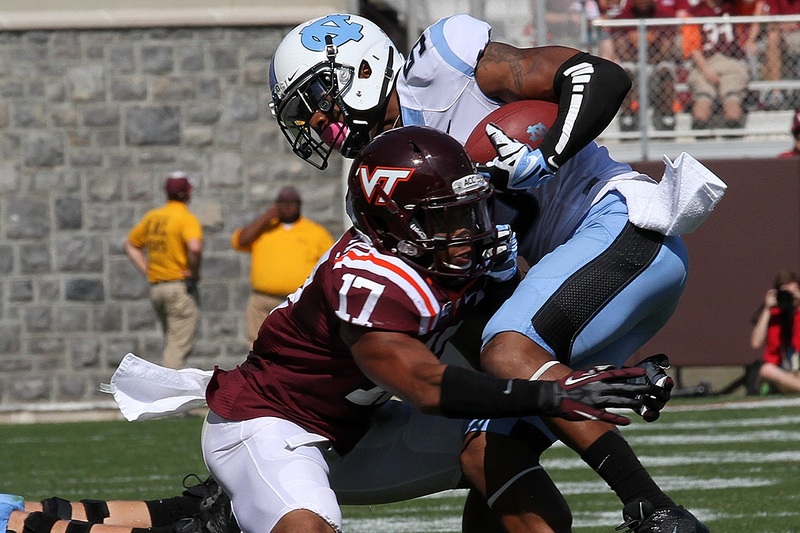 Exum played nickel, rover, free safety, boundary corner and field corner in his three seasons on the field for the Hokies. While his size indicates that he is a safety, he probably played his best football down the stretch of 2012 as a cornerback. However, coming off a torn ACL which forced him to miss the entire 2013 season, many questions surround Exum. Has he regained his quickness? Does he have confidence in his knee? Injury aside, was he ever a true corner in the first place? In all likelihood, zone teams will probably view him as a corner more than teams who play a lot of man coverage. Whatever his position, his versatility has to be considered a positive. In the early stages of his career, he might be well-suited for a nickel or dime role in the NFL. A guy with his size and overall athleticism will also be valued as a special teams performer. After playing mostly special teams as a rookie, Boykin emerged as a major target for the Packers in 2013. Tyler was an excellent college player, but he lacks the ideal bulk that NFL scouts are looking for. It’s possible that he could be a very late pick, but he is most likely headed to a free agent deal. Hopkins was a terrific college football defensive tackle, but NFL teams shied away from him because of how he looks in person. He doesn’t have an NFL build. He’ll be hoping for a free agent contract. Collins doesn’t have NFL size as a defensive end, but he’ll be hoping for a shot at outside linebacker. Edwards was once considered one of the better outside linebacker prospects of his class, however his knee problems have virtually ended his chances of an NFL career. Coles has dropped weight since the end of his college career, which has helped take some of the pressure off his bum knee. However, his past health issues are likely to cause NFL teams to take a pass. That being said, he has worked out for the Arizona Cardinals. Miller isn’t quick enough to be considered for the NFL Draft, and at this point he could be a long-shot for even an free agent contract. My prediction: Fuller gets picked up by the Eagles. After 3-4 years they’ll release him and he will then get picked up by the Redskins. Skins love ’em some Eagles hand-me-downs! I really think if DJ has lost some of the weight he gained due to injury he has a good chance to stick with a team. Miller is the only other guy I see on that bottom list that likely will stick with an NFL team. I guess you could classify it as an “inconsistency and accuracy issue”, but one area that Logan needs to improve upon is his decision-making. A number of his poor throws/interceptions were just as much the result of a bad decision (mental) as anything else. I can’t get over the fact that there have to be some teams who will try LT as a QB but if it doesn’t work out will absolutely try to move him to get him on the field this year. And I hope these guys are drafted as high as possible, but really hope none end up as a Steeler. I’d hate to have to root against them. Nice write-up, Chris. 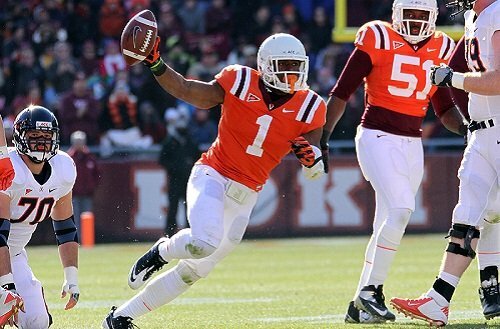 Best of luck to all the Hokies hoping to get drafted. Some of those “draft” guru’s sure must look in on TSL sometimes. 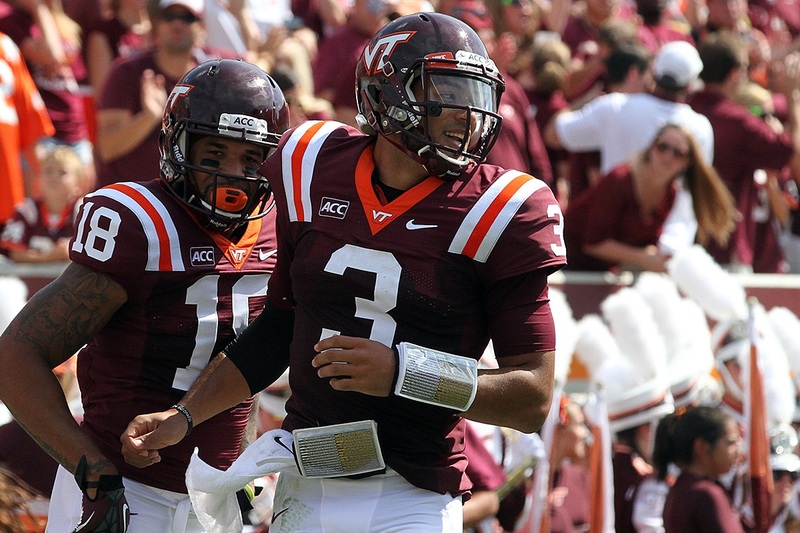 They seem to have bought into perception that Logan Thomas was (is) a tight end. Hopefully he will have a good NFL career at some position and make a lot of money. wasn’t Logan playing TE when he caught that TD pass against Wake? He split out as a wide receiver for one play. He never dedicated any time to the position. He was always a QB. Wasn’t that Central Michigan? I only get to one game every so often and I was at that game. Incorrect. He did line up wide, but he came in for the one play only – on 3rd down.